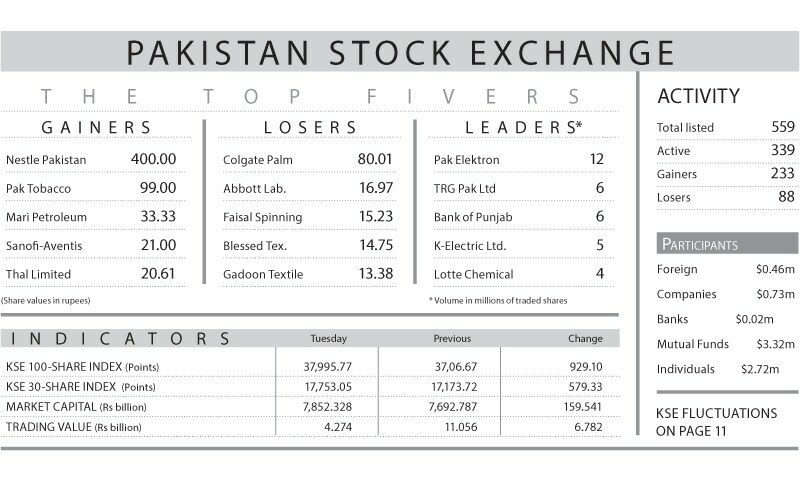 KARACHI: Stocks staged a massive rally on the first day of the new year where the KSE-100 index recovered 929.10 points (2.51 per cent) and closed at 37,995.77 as investors’ interest rejuvenated by positive developments. After an initial hesitation, the index snapped the four-day losing streak and started to climb sending most heavy weight stocks such as United Bank Ltd (UBL), Lucky Cement (LUCK) and Oil and Gas Development Company (OGDC) to hit their upper circuits. On the economic front, the news of China promising to lend $2 billion to Pakistan for reserve management resulted in relief for investors while dust seemed to settle on the political front after the intervention of Supreme Court, which silenced the battle cries of two prominent political parties for control of Sindh. The positives were fortified by the increase in the international oil prices which helped heavyweight Exploration and Production stocks regain some of the lost values. Pakistan Oilfields and OGDC hit their upper circuits while Pakistan Petroleum Ltd (PPL) was up 3.9pc. While foreign investors decided to wait and see, individuals seized the opportunity to take profit with the sale of equities worth $2.72 million. Mutual funds made safe bets in blue chips of the value of $3.32m, which helped dispelled doubts over large scale redemptions. Volumes declined 57pc over the previous session to 96.6m shares and the traded value also dipped 61pc to $30.7m as blue chips quickly moved to hit upper locks with large number of buy orders remaining unfilled. Stocks that contributed significantly to the volumes include Pak Elektron, TRG Pakistan, Bank of Punjab, K-Electric and Lotte which accounted for 34pc of total volumes. Sectors contributing to the index upside included E&P adding 230 points, Banks 214 points, Fertilizer 146 points, Cement 115 points, and O&GMCs 68 points. Scrip-wise, contribution to the 100 index upside came from Engro Corporation up 4.97pc, OGDC 4.74pc, PPL 3.56pc, UBL 4.90pc and LUCK 4.69pc adding 355 points. On the flip side, Meezan Bank Ltd, which closed at negative 3.87pc scrapped 18 points.